When only people got involved in something more than hunting mammoths, they started to build incredible and significant buildings whose use we often can only guess. In Africa Egyptians built pyramids as pharaohs' tombs and mastabs for people of high origin. In Asia there arose the Great Wall - the only building that can be seen from the space. In Europe Mykean civilization from Crete left mysterious legacy, Greeks and Romans put up incredible buildings as well. Closer to our times, Celtic Druids built stone rings and dolmens. In America there were Olmecs civilizations who sculpted enormous stone heads, Aztecs and Mayas built cities - astronomical observatories and Mexican pyramids. What is, in this outline, the place of Tibetan Stupas? In the times before Buddha Shakyamuni high mounds, put up around tree trunks, were used as tombs of rich and important figures. Later, their function as reliquaries became secondary and was replaced by sophisticated symbolism present in every fragment of the building. About 300 years B.C. Ashoka emperor spends the first half of his life fighting to unite the northern India and devotes the second part of life to Buddhist practice and becomes the biggest Stupa builder. He is said to found 84.000 of them. In the 3rd century AD Buddhism gets to Nepal and the ancient Swayambhu Stupa is rebuilt. About 6th and 7th century AD Buddhas Teachings and art of building Stupas is transmitted to Tibet. About 1400 AD contemporary principles of building Stupas were recorded and throughout the years were modified to take forms of Chinese pagoda, Ceylon dagoba, Birman pagada or Tibetan chorten. Similar buildings were built in all places where Buddhism got - from Afghanistan to Borneo and from Mongolia to Sri Lanka. Now it is time for Europe. Stupas assume many roles, also outside religion. Most of them were built as vote offerings, since it is a need of human to ask someone for something. Others serve as signposts and protect the travelers from bad adventures. They can be fragments of battlements or pilgrims' destinations as the legendary Swayambhu Stupa, which, as the legend says, has existed from time immemorial. Swayambhu reflects one of the Buddhist universe symbolisms, which is made of a basic rock - the hill that makes the basis of the Stupa. It is also a part of the building, which symbolizes the embryo, the beginning of life. All this is joined by the axis of Universe - the central trunk of the tree of life, which is based on the rock. As the legend says, once the whole Kathmandu valley was flooded and only Swayambhu Stupa stuck out of the water. Stupas symbolize Buddha's enlightened body and Teachings. The body of a meditator can be inscribed into the building's shape. Therefore, in many Nepali Stupas the eyes are painted below the thirteen rings. The symbolism of the Stupa can be also referred to the Buddhist conception of the universe that is described in the Kalachakra Teachings. Here, we can see that Stupa contains the elements of earth, water, fire and air and its shape reflects the energetic map of the body and the mandala. When one looks at Stupa from the bottom to the top, one can see a symbolic way to the Enlightenment, where every level expresses essential element for a development - Buddha, Teachings, Sangha, Enlightened Attitude and joy as a basis and first steps. Next, we collect positive impressions, develop the way of connecting and then, like a vase, become a proper "container" with sufficient perception and concentration to meditate well. Then, there are thirteen rings on the spire, a "motorway" on which we reach the full realization very quickly. 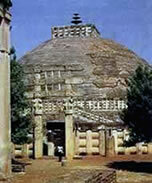 As the Buddhism started spreading in the West there have arisen Stupas of our times in this part of the world. They are built by various Buddhist associations in many countries in and outside Europe. Apart from our technical knowledge, in order to build them we need transmissions and ceremonies that have been kept by Tibetan teachers. One of them is Lobpyn Tsechu Rinpoche, who has assisted building of numerous Stupas of our times all over the world. 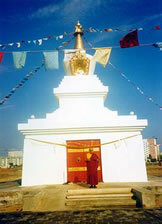 The first European Stupa assisted by Tsechu Rinpoche was built in Spain, in Buddhist center Karma Guen in 1994. 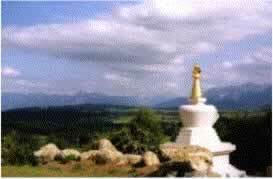 It is a 13 metres high Kalachakra Stupa, which, according to Tsechu Rinpoche is the "Mother Stupa" for the other 17 Stupas that have been built so far, that is: the German Stupas in Auen Buettel, Wuppertal and Schwarzenberg, the Stupa in Austria, in Graz, in Zurich and other Swiss cities, Stupa in Elista at the foot of the Kaukas mountains and the biggest of all of them, 33 metres high, the Enlightenment Stupa in Benalmadena, in Spain, which is still being built. The main assistant of Tsechu Rinpoche in building the Stupas for the last 10 years has been an outsanding architect, Wojtek Kossowski. The modern technological solutions made the building process much faster, yet, still, preserved all the traditional elements. 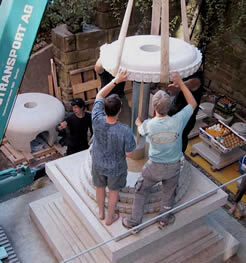 Thanks to the worked out system one can build a 5-7 metres high Stupa in 1 or 2 weeks. The preparations to this process take about 1 year and make it possible to build the Stupa out of the earlier prepared elements in a short time. This hurry is to enable Tsechu Rinpoche to assist in all the building stages which demand precise ceremonies. The shortening of the building time makes it possible for Rinpoche to inaugurate the Stupa during the 10 days session. Because the Tsechu Rinpoche's travel plan is very tight, this shortening is a great convenience. Even though the interior of the Stupas is different and depends on their size, all of them contain the treasuries that are filled with various objects. Apart from the treasuries, the Stupas do not have any "empty" or usable space. This way their symbolic character is stressed. In the center of every Stupa there is a Tree of Life, which is a very important element. It is only when it is placed, the Stupa starts to emit its own energy and function in a proper way. Around the Tree there are mantras, which are placed in special containers. A big part of the treasuries filling are Tsa-Tsas. They are little offering Stupas, which we offer to the Buddha's teachings. There are many kinds of Tsa-Tsa and their production is a ceremony itself. All of them have a hole where a rolled mantra is stuck. Long ago Tsa-Tsa were made of clay  pressed in a metal forms, in the same way as our grandmothers used to make dumplings. Today we cast them out of plaster in silicone forms. The number of Tsa-Tsas needed to fill a treasury depends on the size of both treasury and Tsa-Tsa, for example there are 14.000 Tsa-Tsas in the Kalachakra Stupa in Spain. When filling the treasury, we place one layer of Tsa-Tsa and fill the empty space between them with dry sand. In this way there is a new surface on which we place a new layer and we fill the whole space of a treasury in this manner. There is also jewellery and precious objects placed in a treasury. And, as it is with everything that is to do with a Stupa, it is not their market or nominal, but symbolic value that is important. We aim at as big symbolic value of the Stupa as possible. Everything that we are able to offer and collect in its interior will emit later in all directions, so the more wonderful objects, the stronger energy of the Stupa will be. Stupas are energy generators, which is initiated during a beautiful ceremony of placing the Tree of Life in the central channel of the Stupa. A wooden pole is covered with gems, thousands of mantras and colorful ribbons which are handed to all the participants in the initiation. When it's signaled everyone makes the best and strongest wishes which travel along the silk "motorway" and are stored in a Tree of Life. The "battery" that has been charged with proper energy is then placed in the Stupa. The Stupas that we've built recently have a concrete core and are covered with solid blocks of natural stone. The stone ensures the protection against destructive weather influences and, as all decent clothes, make the Stupas look great. 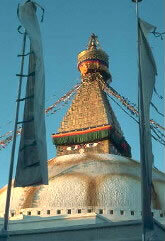 The umbrella on the top of the Stupa (sometimes it is called a crown, which is wrong) is another interesting element. It is a symbol that comes from ancient India where umbrellas were carried above important personages. It is one of the many meanings of this element, which stresses the importance of what is beneath it. Its another meaning is that all the energy collected in our strain for Enlightenment is accumulated by the 13 rings which are getting narrower towards the top, then gets to the umbrella and through its form is spread in all directions of the Universe. The umbrella is, in fact, the only element of the Stupa, which we can allow ourselves to design with a bigger dose of invention and freedom. Computer controlled laser scissors with which we cut the parts of umbrella out of the stainless steel can be used with any complicated patterns. Which Stupa is going to arise in a given area is decided on spontaneously. The building initiators usually have some ideas which are later consulted with the teacher assisting the next stages of building. Strangely enough, the ideas of Western Stupas' initiators have always agreed with Tsechu Rinpoche's wishes. Sometimes the kind of the Stupa is directly connected with the events that have taken place in a given area. In Graz, in Austria, for example, there arose the Wisdom Stupa, which is also called the Stupa of the First Teachings that were given by Buddha. This way the members of the Graz Center wanted to commemorate the first teachings of Lama Ole Nydahl in Europe. Enormous, as high as 11 floor tower Stupa in Benalmadena in Spain, which is still being built is the Enlightenment Stupa. Enlightenment is the ultimate goal of our efforts and the size will reflect its status. 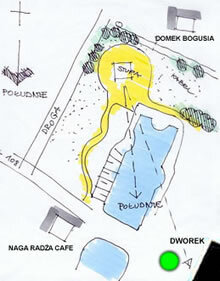 Also in Poland, in the Kuchary Retreat Center, soon there will arise a new Stupa. It won't be as big as the Stupa in Spain, but equally beautiful, with a smart coat of a natural stone. It's going to be the Stupa of Miracles. Its symbolic meaning tells about the miracles that make the false ideas be replaced by the proper ones. Haven't we had recently enough "miracles" in Poland? We quickly get used to good things, but I remember very well the times when I held a petrol stamp in one hand and a passport form in the other, waiting in the queue for a rationed "freedom". This Stupa is going to be not only the model of universal Enlightenment, but also the symbol of our Polish way to freedom, our miracle. 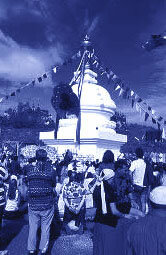 With a help of all of us we will have a chance to experience the Stupa Initiation in Kuchary this year.